The “Cahow Cam” is back and staff at the Department of Conservation Services have just witnessed the hatching of a Cahow chick at 1:45pm today [Mar 4] on Nonsuch Island, and anyone who wants to watch the camera live can do so here or here. Eight new pairs laid their first eggs this January, bringing the breeding population of the Cahow up to a new record high number of 112 breeding pairs [compared to 108 pairs in 2014]. This compares to 17 to 18 breeding pairs in 1960, when the recovery program began and the species was on the edge of extinction. 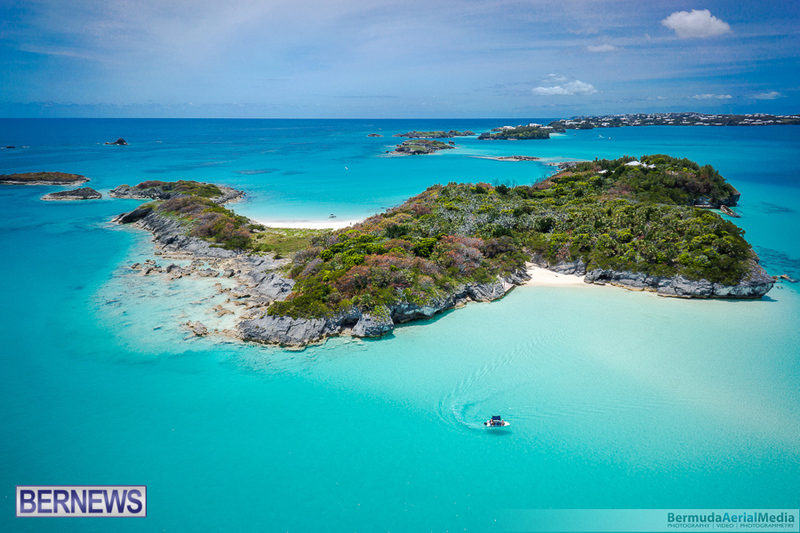 The CahowCam project has been developed and produced by LookBermuda in conjunction with the Department of Conservation Services. Solar energy needed to power the camera is generated through solar panels on the island which have been provided by Ascendant Group, while the wireless internet access needed to stream a live video feed of the inside of the Cahow burrows via the web to the new Nonsuchisland.com web portal and beyond is being provided by Logic. Cahow chicks from a young age seem to spend much time building up and re-arranging the nest material under themselves, showing that nest-building is an innate or instinctual behavior. When not sleeping, Cahow chicks spend much of their time preening their down and feathers, especially around the growing wings. They also frequently spread, stretch and briefly exercise their wings in the nest chamber, especially as they get older. It was previously thought that their wingspan was too long for them to open their wings fully in the nest chamber, but as the wings lengthen, they often spread them out one wing at a time to fit in the restricted space of the burrow. When the adult Cahows carry out a feeding visit to the chick, it usually lasts only an hour or two before the adult flies back out to sea. The chick is often so frantic and hungry when the adult first arrives that it swarms over and pecks at the adult bird. The adult has to preen the chick around its face and head for about 10 minutes, which seems to calm down the chick enough so that successful feeding can take place. The chick inserts its bill crosswise into the bill of the parent bird, which regurgitates the food in a series of 16 to 25 very brief feeding periods, each lasting only 3 to 5 seconds, over a 10-minute period. Once the feeding is completed, the adult will then intensively preen the head and body of the chick, followed by a rest period where the adult sleeps next to the chick for up to an hour or more. The chick is often restless during this period, and the adult will often preen the chick for a brief period to calm it down before returning to sleep. The adult after an hour or two will wake up, and sometimes completely pull apart the nest, throwing grass and leaves over the chick [which does not appear to be alarmed by this strange behavior]. The adult may then feed the chick 1 or 2 more times before leaving the nest and flying back out to sea to begin another foraging trip. The chick then spends a couple of hours pulling the scattered nest material back together and rebuilding the nest. This behavior may represent “turning over the bedsheets”, aerating the nest material and preventing it from decomposing or building up insect or parasite loads. The 54-year ongoing restoration of Nonsuch Island, started by Dr. David Wingate and continued by Jeremy Madeiros since 2000 under the auspices of the Department of Conservation Services, has recently been given a boost by Ascendant Group Limited’s 10-year commitment to help fund further restoration with the donation of volunteer time and $50,000 annually. To date, Ascendant Group funding has enabled Conservation Services to refurbish buildings and educational displays, purchase a new boat, install solar panels to provide power to the island and support the ongoing development of the CahowCams. After several years in the making, Nonsuch Island Nature Reserve now has its own web portal. 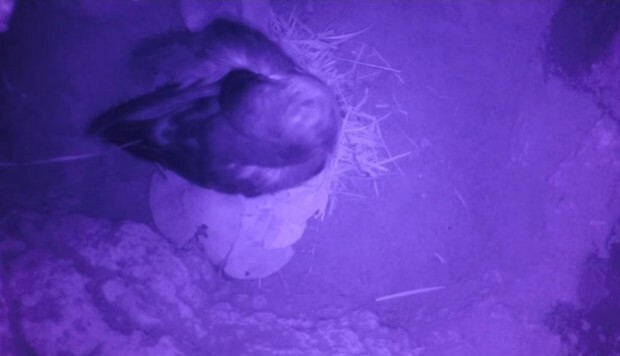 “The Infrared burrow-cam has already proved its worth, both in revealing previously unknown behavior and in allowing the public to follow the development of the chick at the same time it is seen by the researchers,” said Mr. Madeiros. “It has revealed the private life of Bermuda’s critically endangered national bird to anyone, anywhere over the internet. Once the Cahows have fledged for the season, the cameras will be moved to the Nonsuch Longtail burrows to give a view into their nesting habits as well. As an extension of this project LookBermuda is conducting Biodiversity Photography Expeditions on Nonsuch Island – the results of which will be found on the portal and as part of its recently launched AirportArt Project installations. Awesome! Spring is in the air, loads of bluebirds around as well.